In Some Kind of Wonderful, Sarah Morgan returns us to Puffin Island for the second story in this series. This time she takes up the story of Brittany - an archaeologist returning to Puffin Island with broken wrist after falling into a hole because she was laughing so much. The Islanders are sympathetic towards her because Zack is back around the island, and they show it in their usual nosey but caring way. Zack and Brittany were married when she was eighteen. But only for ten days and then he walked out with a note on the pillowcase. The Islanders are sympathetic towards her because Zack is back around the island, the man she was married to for ten days and then he walked out with a note on the pillowcase. Zach's early story drew me in, he was a poor abused kid, then Philip and his wife, who run the Puffin Island Camp took him on when he fell in love with flying, after Philip took him up in a plane. Zach has been touchy about others pitying him. He has learned that he can only rely on himself and that he can neither trust others nor himself to be worthy of trust. However he has set up a lucrative business for himself plus he helps out at the camp. I loved how the story developed, with Brittany now ten years older and wiser. With Zach showing his true self, and his kind caring ways with children and animals. And ultimately his growth as the story progresses until he is at a place where he is ready to take the necessary steps to make a lot of people very happy, including himself. Puffin Island is a delightful place, full of community spirit and beautiful beaches and forest. It's a place any reader would most likely love to visit and even live. 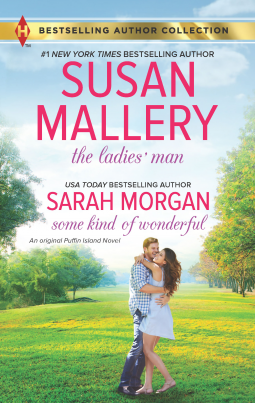 Sarah Morgan writes well, her small community romance stories are fast becoming one of my top favourites. The setting and premise sound wonderful! Hey, "some kind of wonderful." Thanks for sharing...I'm adding this one to my list. I remember your review of the 1st book, it went on my list. I just love the small community setting and Puffin Island sounds adorable. A bit like the little seaside town in Jenny Colgan's Little Beach Street Bakery series. Yes and that Jenny Colgan is to the fore of my mind since you liked it. I will listen to it on audio when I get a chance. I second the Jenny Colgan rec. I think I have the first book in the Puffin Island series so I'll put it on my TBR list.